Few people realise that within beautiful Kielder Water & Forest Park in Northumberland lie some astounding and remarkable art and architecture installations which are free for anyone to see. At 250 square miles, Kielder Water & Forest Park is the largest open-air space in the UK to offer visitors an arts and architecture programme. The latest piece to be unveiled on Wednesday 18 October, close to Kielder Castle, is Castles, Follies and Elephants – a series of eight inspiring installations varying widely in shape, size and form - created by Newcastle artists and architects Oliver Perry, Claire Harper and James Perry. It’s a colourful, brave and surprising creation which is sure to arouse strong interest and opinion. Castles, Follies and Elephants seeks to highlight the influences that have shaped the landscape of the North Tyne Valley and to emphasize the role the local landscape has played historically - from defence, to infrastructure, power and leisure. Each creation within the project has been designed to respond to its selected site, but also to deliberately sit ‘unnaturally’ within it. Visitors will be invited to interact with the pieces in different ways – the creations might simply frame a view, they may draw attention to the landscape’s history, or they might highlight the current forest management. Individual interpretations will be numerous. The project was developed out of an inquiry into the history of the Kielder landscape and the institutions, individuals and organisations that have shaped the landscape and how it is used. Each of the pieces references a moment in that potted history, from the 14th century peel towers, to the 1930s Lewie Camp and the vast underground infrastructure associated with the reservoir. Castle, Follies and Elephants is predominantly constructed in wood and coated in thorough-coloured resin fibre glass for good weather resistance. Kielder Art & Architecture offers an additional, ever-evolving assembly of over 25 widely different and dramatic installations located around the lake and within the forest to be enjoyed by all who visit. Some are temporary and new art is frequently commissioned which means there is always something surprising and different to experience. Although there is no particular theme for the creations - which adds to their fantastic diversity and scale, each installation offers an interesting insight into the way the artist or architect has responded to the unusual environment. 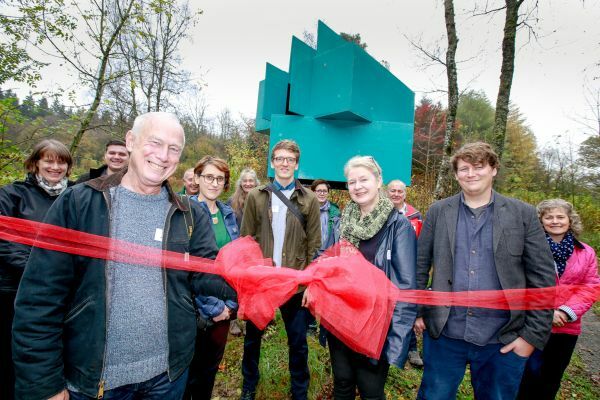 Peter Sharpe, Art & Architecture Curator for Kielder Water & Forest Park Development Trust, said: “I'm really pleased to see the new work Castles, Follies & Elephants coming into being. This commission continues Kielder Art & Architecture's creative exploration of Kielder Water & Forest Park in a very entertaining way, cleverly presenting eight extremely diverse influences on the Park as we know it today, reimagined as a collection of playful fragments of structures installed along a trail in the grounds of Kielder Castle. “As part of our continual drive to bring innovative art and architecture to new audiences, Castles, Follies & Elephants is an immediately engaging visitor experience. However, it also addresses the way history is often made up of improbably linked elements and invites us to imagine how many other narrative connections could be harnessed to tell the story of a single place." Castles, Follies and Elephants is supported by an award from Arts Council England’s National Lottery funded Grants for the Arts programme.